After my first webinar recording, I started thinking more about freelancer-client relationship and those cases when we should say 'no'. And I came to the conclusion that sometimes we have to say 'no' temporarily, to a project, but sometimes we have to refuse to cooperate with a client forever. I came up with 3 main reasons for each of those cases. So, when do we have to say 'no' to a particular project? 1. Bad deadline. It can be a rush job that you just can't finish on time, but sometimes even if the proposed deadline is good there may be some family or personal issues that may keep you from finishing the project on time. After you have evaluated the approximate time your project may take and realized that you can't fit into the deadline, you either negotiate a better deadline with your client, or you say "no" to this particular project and, ideally, recommend a colleague who can fit the project into his or her schedule. 2. Bad price. I know some translators who immediately say 'no' to clients after they read their first message because the offered price is lower than they normally charge. I'd still suggest negotiating the price if it's the only reason for you not to take this project. Saying 'no' once may lead to some better paid projects in the future from the same client if you behave professionally and they see that you are worth the money you ask. I've had that happen to me once and I have been quite happy with my relationship with this particular client since then. 3. Wrong specialty field. Again, some people say that you just need to be a clever person, a good linguist and you must have good research skills. Maybe after I have worked in translation for 30+ years I'll change my opinion (though I strongly doubt that), but at the moment I realize that I can't do the same perfect job with a highly technical or medical or legal text as some of my colleagues who have education in these fields. So these were the three main reasons for refusing a project. 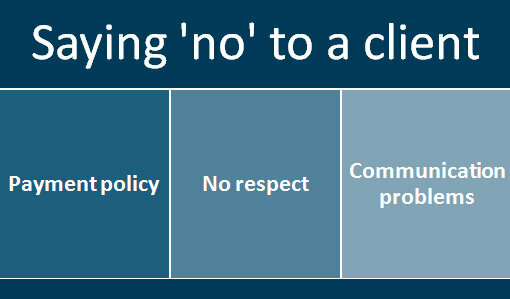 But what are the main reasons for saying 'no' to a client? 1. Payment policy. If the payment terms of a particular client are absolutely unacceptable (too long to wait for payment, very uncomfortable payment terms, the price is too low and negotiating it doesn't help etc.) then the cooperation just makes no sense. 2. No respect. If a client is plain rude, or if he/she treats you with disrespect then you will do yourself a big favour by saying good-bye to them. Even if they pay you well (although this is rarely the case with such people). After all, your emotional and physical wellbeing are more important than any money. 3. Communication problems. Sometimes a client may offer you an interesting project with good payment, but whenever you ask them a question they just ignore you. Sometimes those things are just minor disadvantages in your business relationship, but in some cases they may directly influence the result. If the client repeatedly ignores your messages, they are not as interested in your work as they say. Clients who are interested in the outcome of the project are usually ready to answer your questions and explain anything that's unclear to you. I normally have the same reasons to say 'no'. The deadline is the most significant, but if the project is interesting, I sometimes try negotiating the deadline. In many cases it turns out that the project is not as urgent as the the client states in the first mail (call). AS to interpreting projects, I may say 'no', if it's not my speciality field, but before I say 'no', I try to find out as much as possible about the project. About two weeks ago I got an offer to interpret at an oncological conference in the city hall. My first impuls was to say 'no', because I am just afraid of medical topics, but after a long conversation with the customer I agreed. It was extremely difficult, and I had to prepare for nearly a week, but I managed it! Of course, the speakers, who knew that I was not an expert, helped me in all possible ways. And after the conference I got an offer to continue working for the customer (Koch/Mechnikov Fund, a joint Russian-German foundation). Olga, first of all, congratulations! Actually, I've been thinking about one issue connected with specialising. Sometimes we specialise not because we're good at something, but because we are afraid that we can't do anything else. You know what I mean. Diversity of topics is one of the things I love most about being a freelancer. And I also try to study each project carefully before saying 'no' or 'yes' to make sure I am not reacting out of fear, but I am acting as a professional. In my post I specifically mentioned highly technical, medical or legal fields because I don't specialise in those areas. Medical field is one of those areas which I am entering sstep by step as I translate general healthcare texts or brochures about specific illnesses written for general readers, not professionals in the medical field (luckily, one of my close relatives is a doctor with experience in intensive care etc., so I have a good editor at hand for those projects). But I wouldn't dream to translate stuff written for brain surgeons for example, because my mistakes can lead to fatal results. Hi Carrie! Welcome to my blog! So glad that you stopped by! You are right, there are always people who want to take advantage. And the case you described is definitely another reason to say 'no' to the client permanently. Thank you for sharing your experience! Olga, thanks for congratulations. It was actually a terrible and good experience at the same time. The conference was about prostata cancer, and it was extremely difficult, but I made the customer promise me that I would have all presentations in both Russian and German, and I had them. I knew them by heart and the only thing I was really afraid of were questions people usually ask after the speech. But I had help from speakers and doctors who were present. But I don't think, of course, that I'd do such things all the time. Medicine is a field for experts, and if I really go on working for this foundation, I'd have to study the subject very deeply. Olga, I am sure you did a wonderful job at that conference! I am sure you will study the subject very well. Hope your future cooperation goes well and doesn't challenge you as much as this first time. I think you should try medical and technical texts, little by little, starting from smaller projects that don't look too intimidating. This is usually where the real money is and we are doing it after all to pay the bills. It is now much easier to translate texts in these fields thanks for example to things like Google Translate. Medical terms are usually translated very well by GT because most of the time there is only one English equivalent for medical terms, unlike for most other words.